We’ve all heard that last sentiment repeated often enough since our own “day of infamy” on September 11, but with just a few months experience we still are a long way from understanding the extent and nature of that change. Which is why now is a good time to tell the story of Sherm Feller, and how he made the best of that difficult time and in so doing, created an entirely new form of entertainment that dominates the radio airwaves today. As radio moved from live performances to disc jockeys playing recorded music in the 1950s, Sherm could still be heard on his show playing the piano and sang any one of the thousand songs he has written (he had a Top-40 hit with his “Summertime, Summertime.”) His proudest musical moment came when his “John Kennedy Symphony” was played by the Boston Pops at a birthday tribute to the late president. Sherm Feller was right sixty Decembers ago, when he thought his life and all American’s lives were going to change. But out of that grim day, through a remarkable combination of talent and circumstance, came the nascent beginnings of talk radio, and the making of a reluctant New England legend. It’s a story we should all remember as we try to imagine the changes that are still to come and the choices we all must make. David Kruh is an author and playwright. How did I became a baseball fan? Well, my dad was a Giants fan from the Bronx and my mom used to go to Ebbetts Field in her native Brooklyn to watch the Dodgers. It was inevitable that I became a baseball fan, and since I was living on Long Island, a Mets fan (I never, ever considered being a Yankees fan. Never.) When I got to Boston in 1981, I become interested in Scollay Square (which had been torn down 20 years earlier) after hearing a story from my uncle, a former sailor and doctor who served during World War II (who had found himself with "liberty time" in Boston and subsequently sampled the wares in the Square.) So I wrote a book on it. I worked for several years for WRKO (when it first became talk) and then WEEI (when it first became sports talk) and then the Big Dig (I left l-o-n-g before the leaks started). 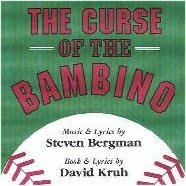 In 1997 I began work on a musical about the Red Sox, and in May, 2001 The Curse of the Bambino Musical premiered at Boston's Lyric Stage.